Pack of 10 Full Tobacco E Liquid Bottles + 2 FREE, so you get 12 in total for the price of 10. A realistic and well rounded tobacco taste from this e cigarette liquid with a balanced throat hit means your vaping satisfaction lasts all day. Each e liquid bottle of Matchless Full Strength E Liquid contains 10ml of 18mg nicotine e liquid containing solution for use in refillable electronic cigarettes. Each e cig liquid bottle features a nozzle 9.4mm in length and 2.6mm wide, designed to prevent leakage of nicotine e liquid during use. The e cig liquid bottles feature a child proof cap. The classic Matchless tobacco taste as used in our cartridges. A realistic and well rounded taste with a balanced throat hit means your vaping satisfaction lasts all day. Full strength nicotine 18mg. 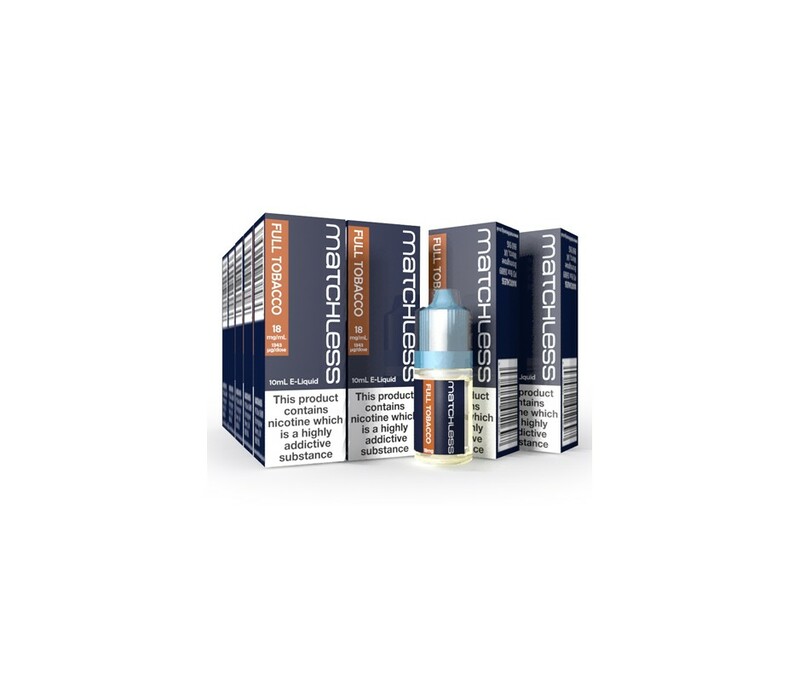 The Matchless Full Tobacco E-Liquid boasts a rich, smooth, natural tasting hit with a tobacco twist and comes in full strength nicotine (18 mg). 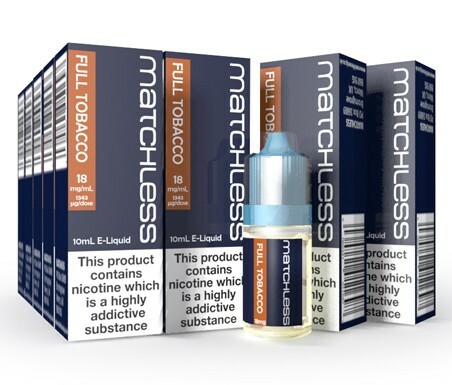 The Matchless Full Tobacco E-Cigarette Liquid comes in a 10ml bottle and is delivered to your door fast. As with all our E-Cigarette Liquids, the Matchless Full Tobacco E-liquid has been developed in our UK labs to the highest standards.